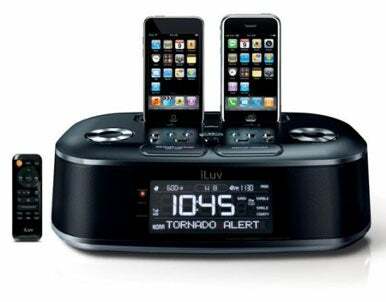 iLuv’s iMM183 Hi-Fi Dual Dock Alarm Clock with Weather Band Radio is making its debut at this week’s Consumer Electronics Show in Las Vegas, not at Macworld Expo. But the digital dual alarm clock should still grab the attention of iPod and iPhone owners thanks to its ability to charge two devices at once. In addition to its ability to charge any iPod with a dock connector, the iLuv iMM183 is compatible with the iPhone 3G (though only one of its dual docks supports the phone). In addition, the device features a weather band radio with support for the NOAA emergency alert system, an LED warning indicator and the ability to store up to 10 alert messages. Audio features include JAura acoustic speaker technology, bass and treble control, programmable presets for six FM radio stations and a remote control to navigate the iPhone or iPod interface. The iMM183 also sports an auxiliary line input and a digital dial alarm clock. The iMM183 will be available in March. iLuv hasn't set a price.